Mexico is heaven for food junkies. Mexican food has undergone a gastronomic renaissance. Recently chefs have buckled up to blend the typical Mexican flavors with new techniques. You will find the world’s finest restaurants here. Not only that but you will find the treasure house of mouth-watering street food from Tortillas to Salsa. Mexico offers you one of the best culinary experience. We will help you find a few places which you must visit if you are here to eat some delicious Mexican food. These are some of the best places to eat in Mexico City. The atmosphere of Pujol is perfect for a romantic dinner. Enrique Olvera is one of the leading food names in Mexico City. It is one of the topmost restaurants, so don’t expect anything less. They serve a six-course meal. Go with an empty stomach. You will be invited in by a charming hostess. The menu is inside a wax sealed file. It gives an old fashioned feel to it. The six-course meal is sure to fill you with delight. The star of the menu is the Mole Madre. It is made of one old and a new mole. Fresh tortillas are served with it. You will love the sauce paired with a carb. The another perk of dining here in Pujol is The excellent collection of wine. You will be awed by the vast range of Mexican flavors are displayed there. Your tongue will love the taste of this decadent restaurant. Just one advice, if you don’t like your consommé thick, then this place will not serve it that way. You will love the warm service of Pujol. If you are ready to book a table ahead of two months then only can you have this divine experience? You will be amazed to see the vibrant food trucks lined up in the streets of Mexico. Vendors will keep shouting tacos, tortillas, salsa. The noise of the knives hitting the vegetables, the whizz of smoke from the pans, the grills all of is a sight which will boost your appetite. But the crowd in the area will tell you it is one of local food hub for oldies as well as youngsters. A place where the ceviche is so addictive that you are going to come back for it again and again, perfect dressing! Taqueria Los Parados is your place for yummy tacos oozing with cheese. Malinalco street is king in blue corn Tlacoyo.Grab some. You will find cheap food in the streets, no doubt. The traditional dishes are a spot on. But if you have to try something adventurous and new, Opt for a fancy restaurant. Nicos is a place where a little is more. This place is not at all flashy. It doesn’t try to speak out loud by just its decoration. Chef Gerardo Vázquez Lugo is the owner of the Nicos. He is a chef who is renowned for making complex dishes out of small. They will use ginger, onions, and mushroom for a simple dish. 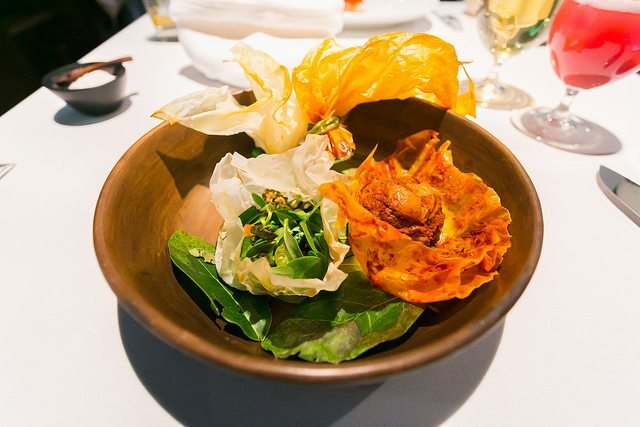 Here at Nico, you will find simple ingredients are used to cook something spectacular. 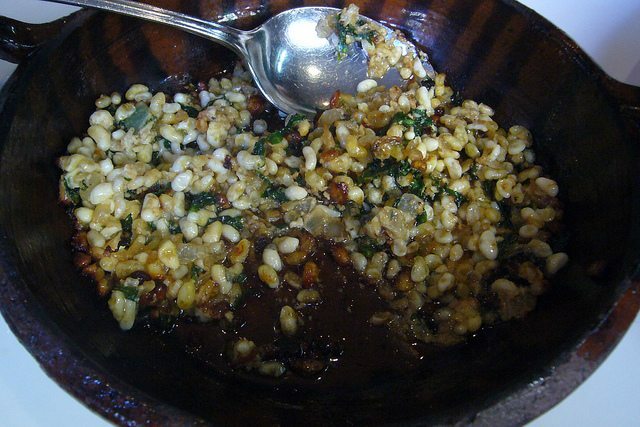 Your taste buds might revolt at the idea of Escamoles, to be more precise caviar of ant larvae. But if there is any place to taste it, Nicos is it. They ooze with butter. You can’t help but moan at the taste of it. Chef Vazquez has a way with local ingredients. Just the traditional methods but put together creatively with new ingredients. You will be impressed by the simple excellence of this place which has stood in Mexico since 1957. Maximo Bistrot might be a new baby in the town, but it is no less good. It is run by couple Eduardo Garcia and Gabriela. Gabriela has worked under Chef Olvera of Pujol. She and her husband both are always trying to cook something innovative. They are masters as organic food. Butter might not be their preference, but they have a good replacement for it. Yes, you guessed it right. It is goats cheese. The ingredients used by this couple are unconventional. Eggplant ash and goats cheese such things are brilliantly cooked into an exquisite dish. We had said earlier that El Caguamo is the best place to taste seafood, but if you are not interested in standing in a queue for shrimps, you can enjoy tuna or marlin here. The name itself is intimidating enough for you to check your balance, whether you have enough or not to enter it. J&G is the shortened version of Jean and George. It drips of shiny opulence. The service is impeccable. You will have a stunning view of Mexico City from the patio seats. J&G is popular for its menu which revolves around locally sourced meat. Whether you are a fan of Hamachi Sashimi or Salmon Sashimi both of them are delivered expertly. You can’t fault anything here. You shouldn’t expect anything less also. The luxurious bar lounge at the J&G is just a cherry on top. Enjoy your drinks too. Whether you are a fan of Hamachi Sashimi or Salmon Sashimi both of them are delivered expertly. You can’t fault anything here. You shouldn’t expect anything less also. The luxurious bar lounge at the J&G is just a cherry on top. Enjoy your drinks too. Mexico is the central hub for foodies all around the world. Here you will never eat bad food. Everything carries a traditional flavor that will tease your palate. The electric atmosphere of food lovers shoveling tasty tortillas and juicy tacos into their mouth will also make you hungry. Book a flight and rampage the food trucks and hotels.